Oh my, the cuteness – she is such a doll. 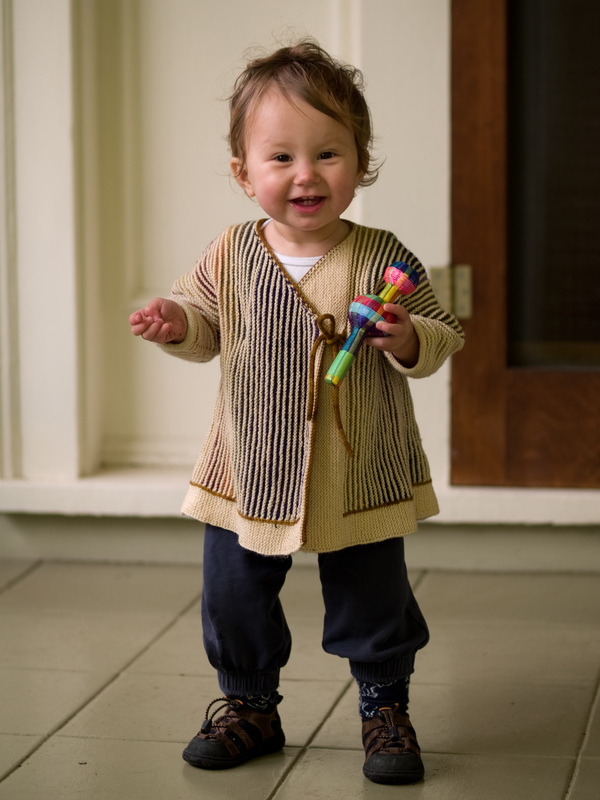 I love the cardigan as well – it is beautifully knitted. Truly cute. I bet for a baby sized like mine one would need to divide the sizes by 2. 😉 Babies do come in different sizes. Mine is just over 6 months old, but is already growing out of most 9-12 sized clothes. Ohhh, this is so incredibly cute! I love Lene`s designs (especially this one), and your colours are perfect! Wow. It was well worth the effort! And Ada is adorable beyond words. The first and last photo are my favourites. Wow! Gorgeous. Love the colours. Those pictures are wonderful! Well worth the wait for the perfect moment. Adorable! Lovely color choices, too! what an adorable little sweater, and your daughter is unbelievably cute!! it’s a perfect pairing of knit and wearer. Fabulous design and appeal! Kudos! That goes for the amazing Minni jacket as well! XOX to beloved model and her Mama. Methinks it’s time to cast on for the final babe’s 1rst b-day jacket! Very, very cute! Love the color. What an adorable sweater. Love the back detail. And, my, Ada is growing up fast! That is just so sweet. You did a great job on what looks to be a complicated design. 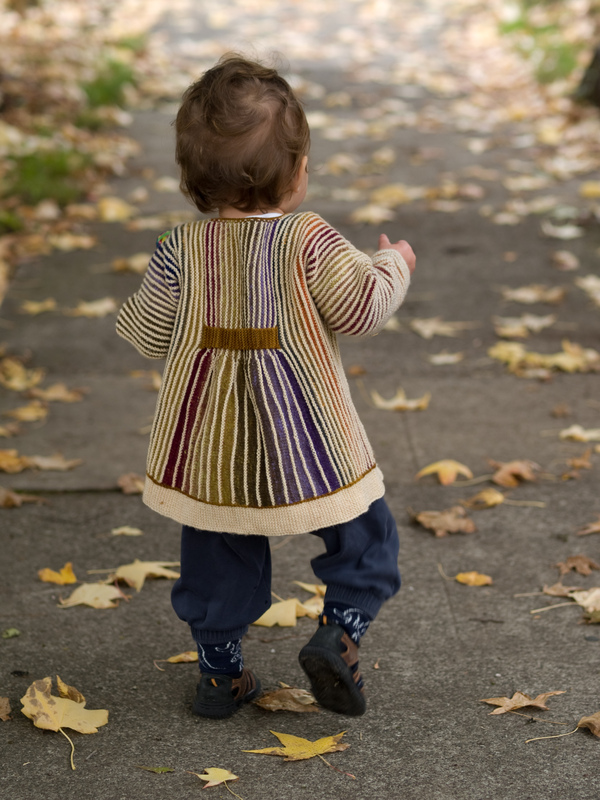 Thanks for the photos that show the back view, I read her blog but I never knew the back was so cleverly knit. 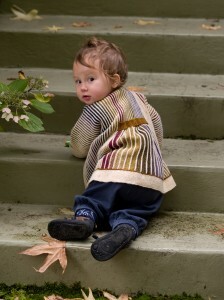 I’m just going to have to buy this pattern for a future grandchild. The jacket is very cuter. And the baby is even cuter! Ada is a little angel!!!! What a cutie…and that jacket. oh my gosh. Makes want to pick up the needles and have a go at it…despite the 10 pages. what a beautiful work… simple and sophisticated at the same time. Precious toddler! Beautiful sweater! I love your comments about toddler and the first year of life. Very well written! What a sweet little coat! The color/ribbing detailing is really gorgeous! I think I might have to add this to my list to make. My hair dresser is not very far along, and actually appreciates this kind of thing (she does crochet mostly). It is super adorable an I already have mini mochi in stock that I will not get around to using for its purchased project. This is the cutest little girl, and I feel like you can almost hear her giggling in the picture. I love the sweater you made for her. I am always sad I don’t have grandchildren, when I see such wonderful things to make for these babies. Great job. My favorite view is the back. Although it is all adorable. 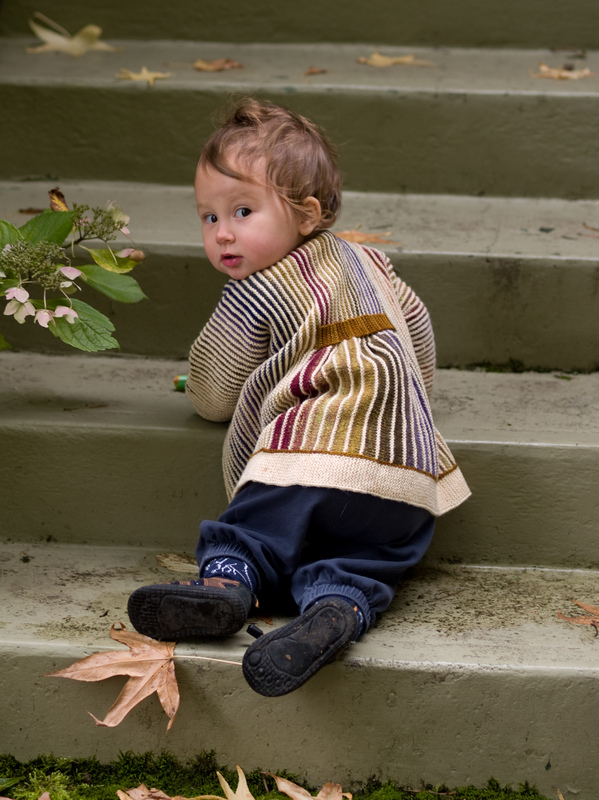 Your sweater is amazing, and little Ada looks adorable in it! They are both beautiful! Lovely photos too. Gorgeous! That sweater is a work of art. It looks very comfortable too. Your daughter is lovely. Wahh! So beautiful! The model, the coat, the photos. Oh, Well Done! I had to add that to my queue, it’s so darn adorable. As is the happy, healthy, busy, cute-as-a-button girl modeling it! That’s just fabulous. Love it! Just love this little coat (your daughter is cute too) – where can I get the pattern. Do you sell this pattern? 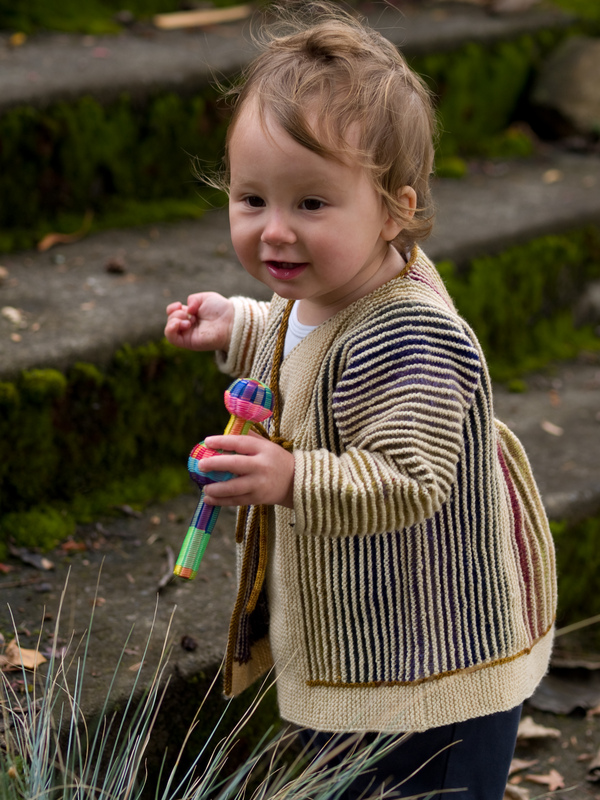 Gorgeous knitting and beautiful little one.